While technical innovations have driven the progress of humanity since the invention of the wheel, the landscape today looks different than ever before. Instead of teams of Egyptians dragging limestone across the desert, or the Wright Brothers hauling out to Kitty Hawk on a Thursday morning, most cutting-edge technology today occurs in front of a computer screen. One thing that has not yet changed, however, if the fact that the tech industry is predominantly male. 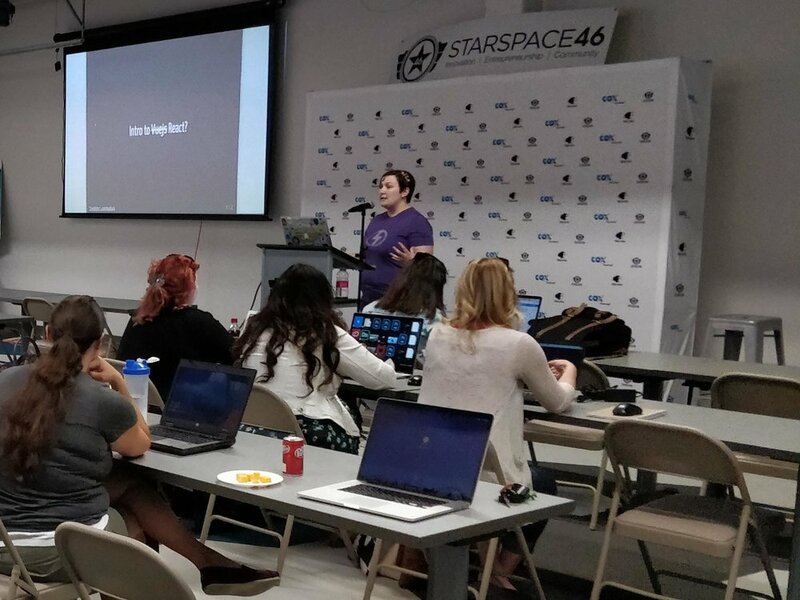 SheCodesOKC, a group meeting monthly at StarSpace46, wants to help improve that by offering education and support to local women interested in programming. The statistics are shocking, no matter how many times I read them. After reaching a high point in 1991 of 36 percent, the ratio of women to men in computing roles has been in constant decline. Of all the computer science degrees earned annually, only 28 percent of the graduates are women. Those are bleak numbers, considering approximately 74 percent of young girls are interested in computer science and STEM careers. Helping women find a place in tech is a big job, but SheCodesOKC is contributing to the change. The Nerdy Girls codeClub was organized by Carmen Bourlon, bringing together female programmers and coders to share ideas and gain insights. Over time, the club grew, and in August 2017, became SheCodesOKC. The new group, now co-organized by Bourlon and Caitlin Stewart, strives to develop the skills of local coders, as well as teach those who have an interest but need to get a solid start. “The thing I love most about coding is building something. Writing code lets me be creative and solve problems at the same time. Most new SheCodes attendees are not currently in the industry and are just starting. My very favorite thing about SheCodes is seeing women progress and gain confidence in their abilities,” Bourlon said. It is important to point out that female computer coders of any age and experience level are welcome. Stewart’s daughter, Vesper, a 6-year-old budding programmer, said “I like going to SheCodes because I get to learn SQL and databases.” In 2017, only 7 percent of startups were owned by women. I have a feeling Vesper is on her way to increasing that measurement in the very near future.